Follow the route round the reservoir, starting at the car park. 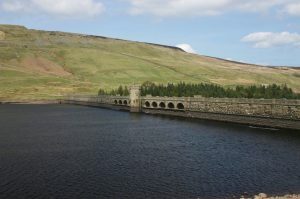 En route you will discover the atmospheric ruins of the village of Lodge that was abandoned when Scar House Reservoir was built, plus you can explore the remains of Scar Village – the settlement built to house workers during the reservoir’s construction. The southern side of the reservoir is an access road which is suitable for wheelchair users as far as Angram dam. The northern side is on uneven tracks and paths, muddy in places and with one short steeper section. The loop is a footpath and bridleway (by permission of Yorkshire Water).